The Military Medical Academy is for the third time in a row the winner of the Corporate Superbrand award, Serbia 2015-2016 in the category of Health Care. The award was granted to the Deputy Head of the Military Medical Academy Colonel Prof. Dr. Dragan Dincic at the closing ceremony on Monday, 13 June 2016 in Belgrade. 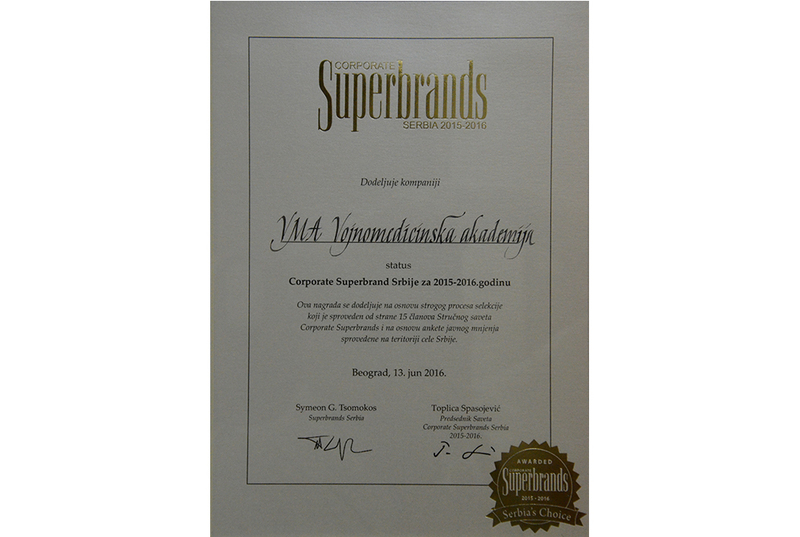 Program Superbrand Serbia which aims at promoting the leading corporate brands in Serbia granted awards in 34 areas of business. This year about 1,600 companies, of which 72 health care institutions participated in the selection process. The competition Superbrand is carried out in approximately 90 countries around the world and in addition to the professional jury selecting the best corporate brands also the votes of the public opinion are included.